This is an open letter to both Block.one and the whole EOS Community, including the people with 10 tokens who think that their vote doesn’t count. Your announcement on June 28 to participate as an active voting member in the EOS public blockchain network is applauded by EOS Cafe Calgary and the greater EOS community. We admire the effort your team has taken to build a more secure and connected network using blockchain technology. Please read our letter below, which we plan to also publish as an open response to the wider community. It is our hope that we will demonstrate that EOS Cafe Calgary is a worthy and responsible steward of the EOS network. Our team at EOS Cafe Calgary has worked endlessly over the past 6 months to add value to the EOS community. We have demonstrated our commitment to increasing ease of adoption for the public by developing key management tools, paper wallets and Ethereum fallback tools. In addition to our own tools for the community, we have strived to grow the network in an impartial manner with a focus on the needs of the community, as demonstrated by our guides, reviews and endorsements for tools by other block producers including Greymass, SimplEOS and EOS Toolkit. 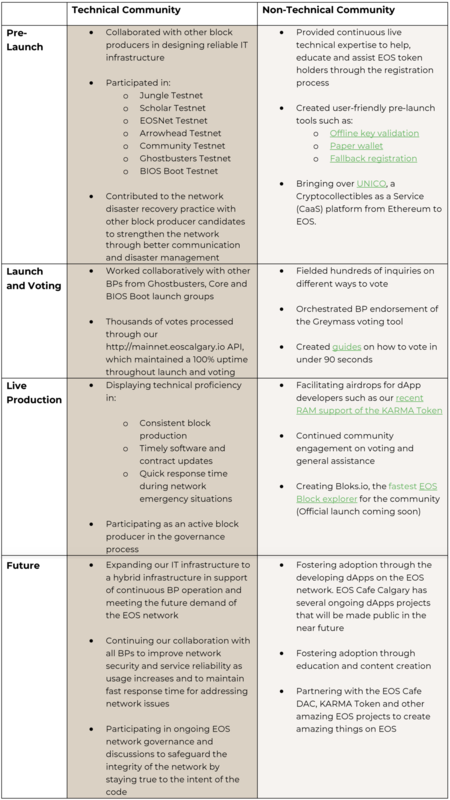 Our proven history of engagement within the EOS community since its inception makes us excellent candidates for Block.one’s vote — a vote we will strive to earn daily as we continue to grow the EOS network. We have highlighted our participation and involvement in the network to date, but we understand that EOS is still in its infancy and will continue to grow its global reach. As we move forward, we will continue our diligent work as a reliable block producer while also developing applications to keep adding value to the broader EOS ecosystem. EOS Cafe Calgary has always conducted itself openly, honestly and in a spirit of collaboration with all community members including other BPs. We adhere to our code of conduct which outlines our values and offers a transparent view into our organization. We will continue to be transparent in all of our operations so the community can inquire about our business at any time. Transparency of identity, activities, and decision-making. We are completely transparent about the identity of our block producer partners, their areas of decision-making, and influence. We will always provide updates on our team and new team members, and are determined to hold ourselves to a higher standard than publicly traded companies. Our team is 100% self funded and we have no outside investors or influence over our activities other than EOS token holders. Our full identities and equity disclosure has been available on our website eoscafecalgary.com since launch, and we have recently mirrored it to an ownership disclosure GitHub. Abides by smart contracts and programming of network participants, in the absence of proven systemic bugs. We agree with Block.one’s stance on The-Intent-of-Code-is-Law. As a block producer we embrace our duty as jury; to evaluate the code of a contract and to vote on a decision to either freeze a broken contract, or replace it with one determined (by arbitrator or affected parties) to operate according to the original intent. We do not agree with or desire any powers or authorities beyond this, especially any that involve enforcement of subjective contract terms. 24/7 timeliness in processing transactions, upgrading the network and emergency response. Compliance with the Ricardian Contracts entered into when becoming a block producer. EOS Cafe Calgary is steadfast in its compliance to the regproducer contract into which we entered. We believe this is the very minimum standard we must hold ourselves to as a block producer, and we feel that the community should hold us, and all BPs, to an even higher standard when voting. We were the 3rd block producer to be 100% compliant with the regproducer contract and receive an A+ rating, as shown by EOS Wire. Alignment on the EOS Constitution, the latest of which can be found here. EOS Cafe Calgary is informed and aligned with the current EOS Constitution. Furthermore, we support and agree with the recent changes. We fully endorse the moves which limit room for disputes and further define the role and scope of block producers within the system. We believe these changes give clarity and confidence to all EOS members and increase the value of the network. The Block.one vote and the future of EOS. EOS Cafe Calgary is thrilled about Block.one’s decision to be an active member in the EOS community. We believe that Block.one’s involvement will help guide EOS to become the platform on which a whole new world can be built. We are honored that we have been able to contribute to something much larger than ourselves, and much greater than the sum of its parts. Should Block.one support us with their vote, EOS Cafe Calgary promises to help the EOS network maximize its potential and stay true to the shared vision of a free market system that secures life, liberty and property. We recognize the need for responsible stewards of the network and believe that we have proven ourselves to be worthy of this responsibility. EOS Cafe Calgary operates on the guiding principles of honesty, integrity and fairness — this will not change. We respect that Block.one has an important decision to make and we appreciate your consideration of EOS Cafe Calgary for your vote.